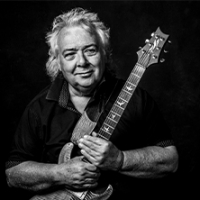 English rock guitarist active since the '70s. He is familiar for playing in many classic rock bands from that era, including UFO, Whitesnake, Babe Ruth, Cozy Powell's Hammer and Paice, Ashton and Lord. He released his debut solo album, "Look at Me Now " in 1981, followed by: "Tribute to Peter Green: Green and Blues" (1995), "Blues Rock " (2002), "Big Boy Blue " (2003), "Stacks" (2005), "Radioland " (2008), "Going to My Hometown " (2009), "Bernie Plays Rory" (2009), "Ballyshannon Blues for Rory" (2011), "Very Local Boy " (2012), plus 2014's: "Shine".